Portable Document Format (PDF) — first launched by Adobe in 1993 and now an open ISO standard — has long been the de facto standard for documents shared via the Web. Thanks to the free Adobe Reader application and Apple’s inclusion of Preview in Mac OS X, anyone who happens across a PDF on a Web site can open it. But what if you just want to read the PDF quickly like any other Web page and move on, without having to download it, open it in Preview or Adobe Reader, and deal with the file in your Downloads folder later? 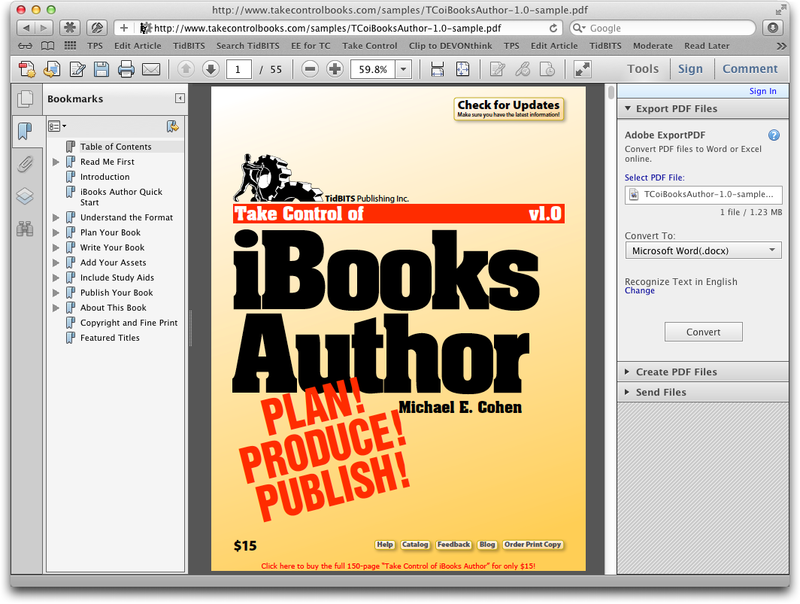 The Mac enjoys Web-based PDF support out of the box; Safari has natively rendered PDFs for many years. Chrome, Google’s increasingly popular Web browser, also now includes native support for PDF. But Firefox, the last of the big three Mac browsers, has long struggled to display PDFs, forcing users to download PDF files and read them in Preview or Adobe Reader. At various times, an assortment of plug-ins have enabled Firefox to display PDFs internally, but many of those have come and gone, leaving Firefox users confused as to the options. This status quo has been shaken up with the arrival of Adobe Reader 10.1.3, Adobe’s free application-and-browser-plug-in bundle. However, installing the Adobe Reader PDF plug-in can affect browser behaviour in various ways. It’s time, then, for an overview of what you can do with PDFs in your browser of choice, what you can’t do, and what you might want to figure out how to do. If you know that a link leads to a PDF you want to download, Control-click the link and choose one of the Save As items from the contextual menu. For a faster approach, Option-click the link leading to the PDF to download the file instantly to your Downloads folder. Once you’re viewing a PDF in Safari, you have only a few options available by Control-clicking anywhere in Safari’s window. You can select and copy text, and you can zoom in and out. You can also change the page display to show one or two pages, either at a time or continuously scrolling. Searching works, and internal links and Web links are hot, but Safari cannot show any bookmarks. And, of course, you can print the PDF using File > Print. Chrome — Chrome’s PDF handling closely resembles Safari’s; the inline PDF renderer is enabled by default, and you can save PDF links to disk either from a contextual menu or by Option-clicking the link. Once a PDF is loaded in a Chrome window, you can save it either from another contextual menu or by clicking the floppy disk icon that appears in the lower right corner of the window whenever you move the pointer in that general location. Unlike Safari, though, the option to disable inline rendering entirely is easily accessible — type chrome://plugins/ into Chrome’s address bar and hit Return, and a list of plug-ins is displayed. Then, simply click the Disable link under “Chrome PDF Viewer” and Chrome will treat .pdf links as files to be downloaded, rather than pages to be displayed. In a further improvement over Safari, no restart is required in order to toggle between the two. As with Safari, there aren’t many things you can do with a PDF in Chrome. You can zoom in and out, select and copy text, print the PDF, search for text, and, unusually, rotate the view. Internal and external links work, but again, no bookmarks are shown. Firefox — Firefox does things differently. The good people at the Mozilla Foundation have clearly decided that native PDF support isn’t necessary — clicking a link to a PDF file displays a dialog asking “What should Firefox do with this file?” Firefox can either open the file in Preview (or whatever your default PDF program may be), or it can save the file to disk. But what it can’t do is display the file in a browser window. In the past, various plug-ins have enabled PDF browsing in Firefox, but have either suffered from inelegant interfaces or have failed to maintain compatibility with Firefox updates. Nitro PDF Software’s PDF Download talks a good game, offering options to save, open inline or open as HTML any .pdf link, but fails to deliver — the HTML option produces a page that bears only a passing similarity to the original document, while the “inline” option actually converts PDFs to images; the results are both fuzzy and slow to appear. Clearly, something more robust is required. What it lacks is support for printing (you’ll want to download and print from Preview instead). But its main flaw is that it is slow, both to load documents initially and sometimes to display pages even after loading. Short documents, such as a one-page flyer from my Web site, load without grief; longer files such as Apple’s product documentation come in rather slowly, but not unacceptably so. The Mozilla support site does, to be fair, acknowledge that this plug-in in still in beta. Adobe Reader: One Size Fits All? — In theory, Adobe Reader 10.1.3’s browser plug-in should provide a unified and consistent style of interaction with PDFs across all three popular browsers. Unfortunately, although the Adobe Reader plug-in works as advertised in Safari, it doesn’t work at all in Chrome, and may or may not work in Firefox. Adobe Reader’s plug-in interacts with Chrome rather oddly. Chrome’s list of plug-ins shows that the Adobe Reader plug-in is available, but if you disable Chrome’s own PDF renderer, enable Adobe’s plug-in, and then attempt to view a PDF, your reward will be a black screen with a small message saying “Can’t load plug-in.” In short, the Adobe Reader plug-in simply does nothing for Chrome users. And so we return to Firefox, which, in its usual quirky and unpredictable style, works well with the Adobe Reader plug-in, except when it doesn’t. In earlier versions of Firefox, including version 3, the Adobe Reader plug-in worked well. The combination of Firefox 12 and Adobe Reader 10.1.3, however, has a major flaw that causes Firefox to display nothing but a blank screen when you click a .pdf link. This bug, according to a blog post on Mozilla’s Web site, affects most users; as if that weren’t enough, it can also cause crashes in Macs running in 32-bit mode. In my testing, on a recent MacBook Pro running Mac OS X 10.7.3 Lion, I spent a lot of time staring at blank pages, without managing a single successful PDF display or experiencing a single crash. Adam Engst, however, clearly has powers I do not possess; Firefox, he tells me, quite elegantly displayed inline PDFs on his 2008 Mac Pro running Mac OS X 10.6.8 Snow Leopard. This odd level of compatibility is a shame, since while the Adobe Reader plug-in feels slower (particularly on load) than the built-in options in Safari and Chrome, it offers more capabilities. A click on the swirly-A logo in Adobe Reader’s floating toolbar reveals roughly the same controls as are in the full Adobe Reader application, with a sidebar showing page thumbnails, bookmarks, attachments, and search results. It’s easy to jump to specific pages, and you’re provided with precise zoom options, along with buttons to show the entire page and to zoom to the full width of the page (Chrome offers similar shortcut buttons). You can also rotate the document, view its document properties, and adjust page display options. A right-hand sidebar provides access to tools for creating and converting PDFs, but those require a paid account with Adobe, and I was unable to get the signing and commenting tools also available in that sidebar to work. In the end, the Adobe Reader plug-in is a somewhat odd beast — more capable than the built-in PDF renderers and Firefox’s PDF Viewer, but slower and a bit clumsy due to the way it tries to shoehorn all of Adobe Reader into a Web browser window. If you want those features, you may be best off simply downloading the PDF and working with it in the full Adobe Reader application. Recommendations — Since PDF is intended to be a unifying technology, one which provides consistent layout behaviour across platforms, it’s ironic that there is so little consistency between browsers in their handling of online PDF files. Fortunately, this translates to choices and options for the user. But what choices to make? For Chrome’s growing number of users, there is no choice — you’ll be using its built-in renderer, though that’s not a terrible thing. Firefox users, on a good day, have a little more choice — PDF Viewer, despite occasional performance issues, is a functional and useful PDF display tool. What PDF Viewer lacks in features, it makes up for by actually working, which remains the Achilles heel of the Adobe-Mozilla partnership, and so at the moment PDF Viewer has to be the PDF renderer of choice for Firefox users. Should Adobe correct this problem, a rethink might be in order, but at time of writing I cannot recommend Adobe Reader under Firefox. Which brings us neatly back to Safari, definitely the most PDF-friendly browser of the three. Built-in support is strong, but the capability to select (albeit in an inelegant manner) between Apple’s and Adobe’s renderers is a bonus. For those who wish only to view the occasional PDF on the Web and move on, Safari’s built-in PDF renderer is fine, but for those who use PDF more frequently, Adobe Reader comes out ahead on features. This is hardly surprising given the extent to which Adobe Reader (and Acrobat Pro) have always offered far more comprehensive support than Mac OS X’s Preview for the format that Adobe itself created. Now, if Adobe could just get the plug-in working in Chrome and Firefox, it might be possible to make a unified recommendation. I am certain that the Adobe Plug-in was incompatible with Firefox 3.x on the Mac (it worked on PC), at least with the versions of the Plug-in that were available before Firefox 4 or 5 came out. But that is rather moot at this point. It's not clear from your article if you are running in 32-bit mode (maybe Adam is and you are not). Note also the Mozilla article states that Mozilla was issuing a block on the plug-in, so you had to explicitly choose to keep it enabled. Also a commenter at the Mozilla site says (like Adam) it's fine in 10.6.8, so maybe Lion is the problem. Yeah, it's very squirrelly, especially with the difference between 32-bit and 64-bit, which normal users don't think about at all. But yes, I am using 32-bit mode since a 2008 Mac Pro defaults to that and I've never reset it manually. I suspect that Steve's new MacBook Pro running Lion defaults to 64-bit mode, so that's probably the difference. As already noted, FireFox must be in 32bit mode as the FF plugin APIs aren't fully compatible in 64bits with the needs of the Adobe Reader plugin at this time. Additionally, I would like to remind the author as well as the readers that PDF is an OPEN STANDARD, ISO 32000-1. It is no longer "Adobe PDF", but "the World's PDF". Indeed - tweaked that text at the start to clarify that the format originated with Adobe but is now under the auspices of the ISO. Mac mini (late 2009), OS X 10.6.8, activity monitor shows kernel-task and Safari and Safari Web Content as kind: Intel. PDF viewing in Safari broke around the time I installed Adobe Reader 10.1.3 – clicking links displayed only a dark grey blank window with a close button, control-click did not offer the option of downloading the pdf. What baffles me is those hyperlinks that insist on my opening the pdf in a browser window and saving it from there, refusing to permit me to control-click in order to download the pdf directly. Anyone have a fix for that ? Disturbing afterthought: perhaps the mere asking of this question reveals me as a Rosetta-using fogey! With a PDF open in Safari, I just use Command-S. Simplest for me to remember, and I didn't know about the popover. "The good people at the Mozilla Foundation have clearly decided that native PDF support isn’t necessary..."
Mozilla is actually who developed PDF Viewer (AKA PDF.js) in the first place. It's been in development for a while. The intent from the beginning was to be included with the browser. It's planned to land soon (probably with Firefox 15). Also, printing is on the way too. 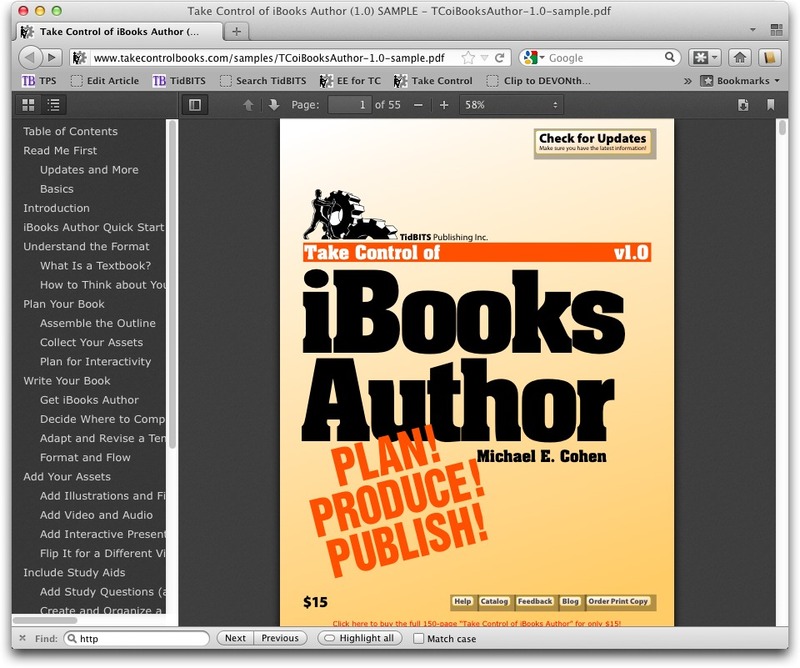 I'm using pdf.js with Firefox 12 - it's great, but it was long overdue. I agree with the OP's sentiment. I pretty much quit using Firefox after version 3 up until version 12 (pdf.js came out for version 11) due to the lack of a decent pdf plug-in. I kept version 3 on my computer but hardly used it. I've sensed some surprise or frustration on the part of Mozilla as to why so many people stayed on FF3 (they've recently started "forcing" upgrades) - I think the reason is that too many critical plug ins broke and were not replaced or updated. With pdf.js I hope they are finally getting their act together (I personally try to avoid the Adobe plug-ins). I dislike the jerky, too-fast scrolling in Adobe's plug-in, so I finally disabled it, leaving me with Apple's plug-in in Safari, which I prefer. I rarely use Firefox, but it irks me that it looks like plug-ins are for all browsers or none. I'd like to use Adobe's plug-in with Firefox--the few times I ever use the browser, on the off-chance I have a PDF to view--and Apple's in Safari. Is there any way to accomplish this? I deleted Adobe Reader from my Mac years ago when I realized I was spending more time updating it for security issues than using it. Preview and the built in Safari preview is more than sufficient. One additional shortcoming I see with Chrome's built-in PDF viewer is that it may not render the font used in a PDF file correctly. I notice this in newsletters I post for our MUG which uses a sans-serif font. The line and letter spacing are just wrong when viewed in Chrome, but not with Safari using either its built-in viewer or Adobe 10.1.3 plug-in. Interesting - I've not run into that. Can you post a link to one of these so I can check into it and report it to the Chrome team? Sure. You can check anyone of our newsletters at http://www.applepickers.org/newsletters.php The default font we use is MyriadPro Regular which looks a bit heavier and more compact (at least on my screen) when viewed using either Safari or using the Adobe PDF plug-in than it does in Chrome. Strange - it looks the same in every renderer I try here. I was afraid of that. It might be interesting if others can take a look. To me the line spacing in Chrome is larger and the font is rendered slightly lighter than in the other in Safari or in Preview. Perhaps it's due to a combination of screen size and resolution. Not a big deal in any case. "The Mac enjoys Web-based PDF support out of the box; Safari has natively rendered PDFs for many years"
Interesting. I haven't been able to see a PDF doc in Safari for years. I've had to use add-on only to have them rendered useless by the next Safari update.